One of the highlights of feeding birds in the spring is seeing all the colorful birds up close. I enjoy watching the yellow American Goldfinches. 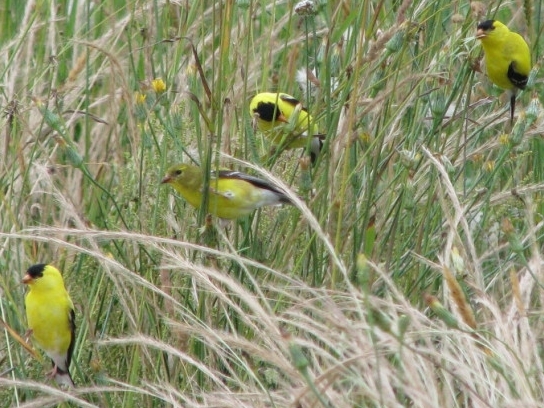 They are in Michigan year-round but switch from their drab winter feathers to bright yellow in April. These cheery songbirds are vegetarians and like a variety of flower seeds and spring greens in the wild. If you want to bring them to a feeder we recommend offering fresh Nyjer® (thistle). The best thing about feeding straight Nyjer is that it attracts mainly goldfinches and deters squirrels, blackbirds, starlings and other big birds. 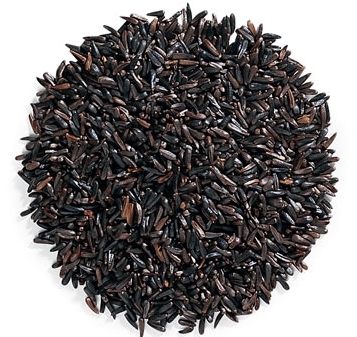 Nyjer is teeny, tiny black birdseed, high in oil content and an excellent energy source for these active birds. It has been heat treated to prevent the growth of any noxious weed seeds and does not sprout under the feeder. The scientific name for the Nyjer plant is Guizotia abyssinica and is not related to the purple, prickly, Canada Thistle weed at all. There are special feeders made to hold Nyjer Thistle. You can choose from a variety of finch feeders at Wild Birds Unlimited. I have five Mesh Finch Feeders at my house. They not only let the finches land and feed in whatever position they choose, but they also allow air circulation to keep your Nyjer Thistle as dry and fresh as possible; something that's very important to these picky eaters. Habitat can also be a key to attracting Goldfinches. In this case you do less work, not more. 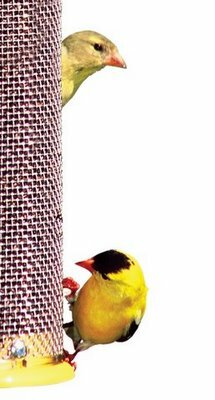 Don't worry about dandelions and don't cut off the tops of your Marigold, Zinnias, Cosmos, or Coneflowers...Goldfinches love the seeds. The birds make the flowers dance as they flit from flower to flower looking for food.